UPDATE - Based on feedback and input I’ve tweaked some of the pedal placements - the core methodology still stands, while relatively positioning of certain pedals can be fairly nuanced! This subject matter has become the most popular of all the different articles I’ve posted. And the original piece went up in February 2017 - so I felt it was opportune to revisit, review and revise that original methodology. I’ve tried to strip out the more branded naming conventions and use something which is more neutral and generic - even though the second chart and some of the descriptors here of course reference those benchmark amp / pedal / product names. I evolved this particular methodology to gain a better understanding of all the different types of ’dirt’ pedals, and I’m still discovering odd variations every day - and new sub-genres even. Various players tend to be active within certain ’bands’ of the Saturation Scale - which I have conveniently split into 12 Segments. I think there could be more, but 12 seems to be about right to communicate the key differences. It is critical to point out also that pedals within each segment and category can vary enormously by starting saturation, tonality, range and tweakability. Some players prefer fewer controls and others like a broader range of tone-sculpting ability. I often grimace when reviewers talk about being able to dial in ’bad tones’ as that is often the essence of the more versatile pedals - in that they have the widest range of active and even parametric tone controls which can radically change the core tone of the pedal. This is not the same as having a pedal which by default as inherently uneven tonal characteristics. In the best pedals you get a wide, lively, dynamic sound stage with plenty of articulation and note definition - you also get a pretty harmonic blend of Bass, Middle and Treble frequencies. On more poorly engineered pedals you will have poorly blended frequency profiles with too much separation in the bands - so that you get a somewhat spiky and uneven sound. My preference is typically for 3-band EQ where possible, but on occasion a well 'tuned' single tone dial can be all you need or want. In my original piece I really tried to cover all things to all people, while in this update I've chosen 12 of my favourite / preferred pedals per each of the 12 segments. For me there are various different types of Boost and I pretty much use every type in my pedal-chain - the first is the always on 'Tone Enhancer' which gives your core tone more warmth and sparkle. I initially had the Mini Xotic EP Booster for this, and now have the excellent Jackson Audio Prism. I next have the Spaceman Effects Mercury IV Germanium Harmonic Boost to further sculpt and enhance tone - this is used on a more incidental basis. I then have various pedals - including my Strymon Sunset and Riverside which I use as incidental Treble Boosters and similar to occasionally add saturation and heft to certain tones - in fact one setting is pretty permanently a booster, while the other on each is a high gain distortion. There is then the Modded Boss GE-7 EQ which is also a tone enhancer and acts as a sort of boost via those frequencies which are being enhanced. The Xotic EP Booster I used was also a modified unit - by Alchemy Audio - to have all the dip switches as toggle switches on the outside of the pedal - highly recommended. I've included all the various monikers above, and I used to use the word 'Mild' also. In this case you might say that it lets as much through of the original signal with the least amount of colouring - of course there is always some degree of 'signal colouring' with gain boost - otherwise this would simply be known as a 'Clean Boost'. The Klon-type circuit is the best known here, and derivations of - but there are other excellent non-Klones in this category too - like the Lightspeed and Timmy. The Wampler Tumnus Deluxe has immense tonal and gain variety, but my current favourite is the diminutive / mini Decibelics Golden Horse which has just a tremendous core tone, and an exceptionally versatile and wide-ranging single tone-dial - it's the one that's currently active in my pedal-chain. The Ibanez / Maxon (OEM) Tube Screamer Overdrive is probably the best known and most copied variety of tone enhancer. Many use it to boost or enhance the tone of their amp with this - using it principally as a Boost pedal, while others crank it up and use it specifically as an overdrive tone on top of a clean signal. As with any pedal deployment there is no right answer or use here - all are valid. It's just that early amps had very little by way of tone controls or Master Volume even - so that if you wanted to enhance your tone or kick in a Solo Boost, then the Tube Screamer was the very best tool for that purpose. Latterly the trend grew for more subtle and dynamic overdrives and the Tube Screamer core tone became sought after on various pedalboards. I have used Tube Screamers for a huge variety of functions, but right now there is not one in my chain - it has been momentarily kicked aside by the Spaceman Mercury IV Germanium Harmonic Boost. Incumbent in that slot prior to that was the superbly versatile 9-mode JHS Bonsai, and before that the really smart Foxpedal The City V2. There is a tremendous range of superb high quality Tube Screamer types - from killer Minis - through the typical compact form factor, and onto kind of all-round Tube Screamer Workstations like the PLBR Effects Floral Green and EQD Pallisades. At this juncture I feel it is important to mention that there is in fact a vast overlap on several of these pedals - and they can appear in very different parts of the saturation spectrum / chart - depending on exactly which pedal you are using and how you set it up. Such that some may choose to have a Harmonic or Dumble OD - set very mild, and with a lower level of saturation than say the Tube Screamer. Yet in my various trials and experiments I found that the pedals I deployed within specific segment families largely tallied up with their sort of root position on the chart. Harmonic and Dumble Overdrives have highly complex tonal profiles and you get quite different textures and tonalities out of them depending on how you set them up. Many of these use Germanium or soundalike transistors to produce that richly textured sounds - and you can often control the harmonic content separately. I also find many of these pedals have a slight 'fuzz' quality to them - such that the Dumble has a hint of fuzz on the edges of its tonal palette - which is what makes that pedal type to special for me. Yet much like the Tube Screamer, I don't have a Dumble variant currently in my chain - but I'm deploying a Spaceman Aphelion Harmonic Overdrive and Custom Tones Ethos TWE-1 to cover the same sort of range, but not exactly the same sort of tone! The first pedal I deployed within this segment was my beloved mini Mooer Blues Mood - which was then ousted by the Boss JB-2 Angry Driver which combines both Blues Driver and JHS Angry Charlie circuits. Pride of place currently is a Keeley Freak Fuzz Modified Blues Driver I acquired off Reverb.com - which gives me the fatness I original had with the Mooer, and a lot more besides. In the same segment - around the same level of saturation but overlapping slightly lower overall are the Marshall Bluesbreaker style and Tweed Amp / Drive style pedals. I've used both those varieties intermittently, while the sort of slightly fattened Boss Blues Driver tone is really my favourite in this slot. Note that the Blues Driver can get pretty thick and saturated and into nice singing distortion. For the most part those these tend to be deployed as bluesy type pedals - just beyond the line of breakup. For me the 'poster boy' of Crunch is still the Fulltone OCD, although that was latterly bumped aside in my chain by the far more versatile Hamstead Soundworks Odyssey Intergalactic Driver. Currently though I get my core Crunch out of the Custom Tones Ethos TWE-1 pedal as well as by combining the Spaceman Mercury IV and Aphelion, and the boost channel on the Strymon Riverside! If you crank up the crunch slightly you're usually only half a step away from a classic Marshall Plexi style tone - so many of these pedals approach that territory, while other more typically Distortion pedals can often be toned tone - via guitar volume dial even to get an exceptional crunch tone. There is really quite a wide variety of pedal types that can approximate this sound - including all those mentioned here. As reported on other features - I was relatively late to latch onto Fuzz sounds, but now these pedals make up the greater part of my collection - with so many diverse sounding ones, and only a fraction listed across the below twin listings of a dozen examples each. Most players are sort of familiar with say Fuzz Faces, Maestros and Tone Benders - but even within just 3 sub-genres you have all manner of variations based on component choice and circuit modifications. Two of my favourite Fuzzes are based on the Fuzz Face circuit but sound very different - the Germanium singing but quirky Spaceman Sputnik I, and the Silicon raw and broken-speaker-distortion sounding Abracadabra Ayahuasca. 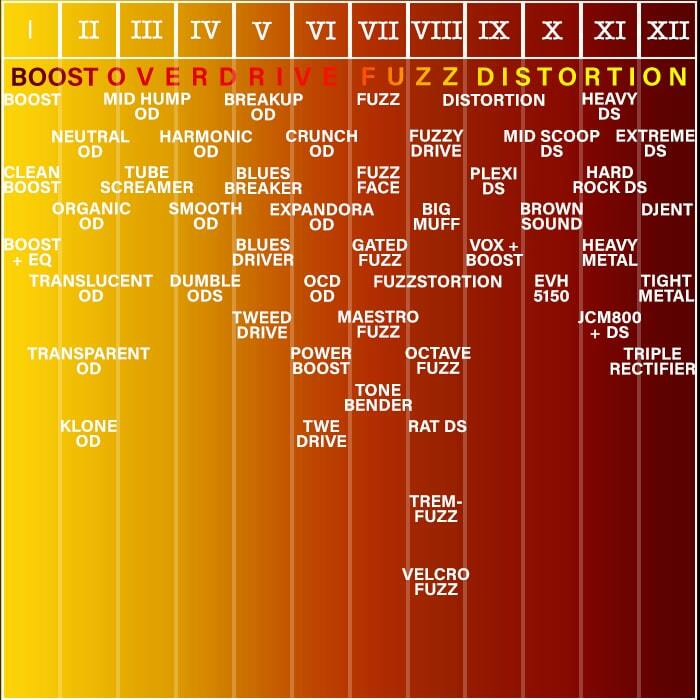 I split the Fuzz category by core types and whether more singing or more distorted and gritty. I have more than 70 fuzz pedals and they all sound amazing in their own ways - I typically like those with a few extra controls - so you can squeeze out every tiny degree of goodness from the transistors and circuits. Some fuzz circuits have as many as 6 different transistors to create their thick and saturated sound. Two incredibly versatile and varied varieties sit at the root of Fuzzy Drive and Fuzzstortion - and I often like the quote the circa 46+ core components of a typical Big Muff, or the raspy goodness of the LM308 OpAmp driven Rat-style Fuzzstortions. Some players only like the smoother or more overdrive accentuated types of fuzz, while I like pretty much every variety including the really nasty sludgy angry electrical storm ones. A number of the larger types here have a vast plethora of additional switches and dials - for the widest possible tonality - and many can easily go from lightly accentuated overdrive to fuzz, to full blown fuzzstortion. I think many who hate fuzz pedals just really aren't familiar with the vast variety on offer, and forget or are ignorant of the fact as to just how much classic rock was created with fuzz pedals! In many ways there's often just a hair's breadth between Crunch and Distortion - they sit either side of a pretty narrow line - and as reported previously you can usually dial up from Crunch or down from Distortion to achieve one or the other (usually, but not always!). The vast majority of amps are derived from the early Fender 'black-face' style amps, with the first Marshall Amps being a great example of this - where players wanted to get grittier tones out of their amps. The most celebrated of 'gritty' tones is of course the 'Plexi' sound of those mid-to-late 60's plexiglass covered facia type Marshall amps - like the Marshall Super Lead from 1965. The 'Marshall Amp in a Box' pedal runs the Tube Screamer pretty close for derivations and variety - and makes up most of the below listing, although the Barefoot FX Emerald Green Distortion Machine and Origin Effects RevivalDrive also have superb Top-Boosted Vox voicings - i.e. Brian May style Treble-Booster-Enhanced Vox AC30 sound. One Edward Lodewijk Van Halen of Dutch and Indonesian parentage was to modernise the sound of Rock in 1978 alongside his brother Alex on their first self-titled family name album. Eddie was one of the first to combine vastly different guitar parts and components within the same build using Gibson PAF-style humbuckers in a Strat body, and with an entirely different neck - the red, black and white striped 'Frankenstrat' of legend. He then tweaked his Marshall amp's output using a Variac / variable power transformer to get more saturation at lower volumes - adding phaser and flanger into the mix with somewhat scooped middle frequencies that birthed a whole new sound which still influences and impacts on core distortion sounds nearly 4 decades later. The sound of the guitar on that first album was just amazing and still is - there are of course all manner of variations on that tone and every player has their own preferred tuning of said 'Brown Sound' - but rare is the rock or metal player in recent years who does not look back to Eddie's influence. My current main choice here is the super-versatile MI Effects Super Crunch Box, but I rotate fairly regularly with Suhr Riot and Bogner Burnley which are excellent too, even though not nearly as tweakable. Also props to the rare Japanese 320 Design Brown Feather Distortion pedal which just missed the listing - but should be noted for its awesome tone. So the final categories can have a degree of overlap even with the earlier Scooped and Plexi style distortions - depending on the range and scope of those pedals. Generally though the further you go up the scale the more brutal / clipped the distortion gets well as tighter and more percussive. A number of the lower high gain metal types have a more elastic / sag-y distortion, while at the very top of this curve you get super tight punchy wall of gain. Lower distortion style are often approximated to Marshall Plexi style amps, while the higher gain ones ramp up from the Marshall JCM800 style and Mesa Boogie Double and Triple Rectifiers. At Level 11, we have slightly more sag and bounce with a slightly more extended tonal delivery. I think Fat and Elastic are good descriptives at this level. At the top end of the Gain and Saturation scale you have the very Djenty tight and percussive metal sounds of Bogner, Diesel, Engl and MESA/Boogie to name a few. This is your maximum distortion level and can have both elements of more regular drive distortion as well as sludgy doomy high gain fuzz flavours. My current three hard hitters of choice are the Dual Channel Empress Heavy, Super-Bassy MI Effects Megalith Delta and legendary Metal Sound of the Diezel VH4. In some ways the REVV G3 in the previous category can also be dialled in to be at this level and can equal and exceed these in some areas, but currently I have it dialled in a notch down the scale - for still super tight heavy distortion. I included the Empress MultiDrive in the middle of the top visual as it is one pedal that can pretty much cover most of the range featured here. It used to be my 'Plexi' pedal of choice - but that role is currently taken by the Origin Effects RevivalDrive, so it's reduced to an understudy / sometime substitute - yet truly is a most excellent and versatile pedal. There are lots of additional alternatives that could be listed here above - obviously these are my own favourites and depending on your own rig and setup - results can vary, and there may be other pedals more suitable for you / and or more to your liking. The general purpose of this though is to indicate the vast range that 'dirt' pedals cover, and roughly where they all sit / fit in within the grander scale of things. I am always tweaking and fine-tuning my core tones - possibly one day I will hit something that will become 'My Signature Tone', but in the meantime I really enjoy experimenting and seeing how much variety can be wrought out of these pedals. Certain players are all about the modulation or time-based effects, while most of what I like revolves around different degrees of Boost, Overdrive, Fuzz and Distortion.